The NES Classic Edition is the hit holiday product from Nintendo that bundled 30 classic NES games into a cute console with the old NES look. It even came with controllers that resembled the original NES controllers. People loved this thing so much that any units that stores got were quickly snatched up and immediately listed to ebay at double to triple markup. Few people who actually wanted one to play the darn thing got one. In a statement made in January of this year, Nintendo announced that they had sold a cool 1.5million NES Classics. That means that somewhere in the ballpark of 250k people have one to actually play right now, while 1.25million units are sitting languishing on ebay and Craigslist postings. But what really gets my goat with this latest news is Nintendo’s completely tone deaf reasons for dropping the system. Let’s break down the absurdity of this announcement line by line. Throughout April, NOA territories will receive the last shipments of Nintendo Entertainment System: NES Classic Edition systems for this year. We encourage anyone interested in obtaining this system to check with retail outlets regarding availability. We understand that it has been difficult for many consumers to find a system, and for that we apologize. How about instead of a hollow apology you actually produce enough supply to meet consumer demand and make tons of money yourself rather than providing the means for scalpers to make tons of money? People want the NES Classic Edition not apologies. Make more to sell. Considering you are discontinuing the system rather than producing more of them, I really don’t think that is true in the slightest. and we greatly appreciate the incredible level of consumer interest and support for this product. Do you want to know how you could really show us your appreciation? You could do it by producing enough units to meet consumer demand and let us buy them. It is really that simple. We want to support you but you have given us no means to do so. NES Classic Edition wasn’t intended to be an ongoing, long-term product. This is disappointing but it became quite clear when you never even made an attempt to meet consumer demand for the system. There is a massive market for systems like these and making it a permanent part of your hardware portfolio is a great move and would benefit you in the long run. And if that is true, I really don’t understand what the point of it was at all. Had the system been released a year earlier and in greater quantity, I could see it as a hold over option during the time period between the slow agonizing death of the Wii U and the launch of the Switch, which came out just a few short months after the NES Classic’s retail launch. But that isn’t what happened. Instead, we got a system that give Nintendo a short boost to holiday sales and that is about it. However, due to high demand, we did add extra shipments to our original plans. But clearly not enough to meet the consumer demand. 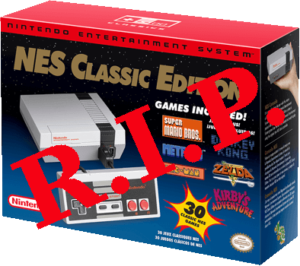 One easy way to see that you haven’t met demand is to look at the prices of the system on ebay and other sites frequented by NES Classic scalpers. But I repeat myself. Sadly, this is yet another blunder from Nintendo of America that has become quite the norm for the company. NOA has never had a good handle on the North American market and seems to be quite reluctant to even learn what we want from the company. People love the Switch. People love the NES Classic Edition. There is no reason to believe in any capacity that both systems couldn’t live in harmony together on store shelves for another year or more. It really is in your best interest to keep this system alive. That is, if you like money. The best theory I’ve heard for this is that Nintendo is switching over production plants from making NES Classics to making Switches. It’s hard to say which of these has the higher profit margin, but customers with the Switch will be buying further games for it, and the licensing fees for those will benefit Nintendo indefinitely into the future. So, I can see how some people in Nintendo might be convinced this makes financial sense… but those people would have to be blind to the possibility of simply opening more manufacturing plants. Sure, the demand will likely go down eventually, but when the NES classic is no longer profitable, it will be precisely the time to roll out an SNES classic, so it’s not like those plants are going to go to waste for a long while. It seems to be Nintendo just being far too conservative for their own good. They would rather undersell a product by 10x than manufacture 10% more than will sell, which is hardly the road to maximize profits. And that doesn’t even get into the value of consumer goodwill, which they’ve lost a big chunk of with each of these supply fiascos. That would be the least bad reason for ending production of it. But if that were the case, I see no reason why they couldn’t tell people that.